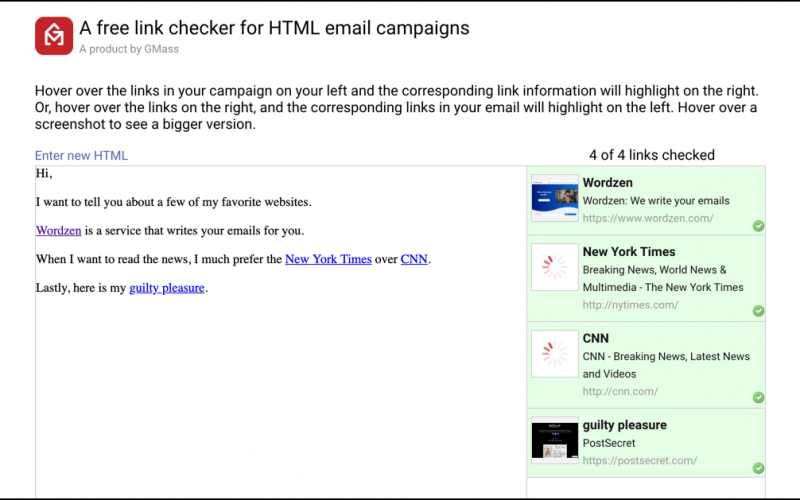 We just launched a new tool for email marketers — a link checker! Just paste the HTML for your next email campaign into our free link checker, and watch the magic happen. All links are checked, and the title and screenshot of each webpage is shown. Just hover over the links on the left, or the links on the right, and you’ll see the corresponding links and screenshots. Your links are valid and not broken. Your links point to where you intended. Often when setting lost of links in an HTML email campaign, it’s easy to make a copy/paste mistake and set the anchor text to point to the wrong URL. With the automatically generated screenshots, you can quickly see if you made a mistake. This tool is free to use, and can be used with any email marketing service like MailChimp or Constant Contact. Of course, there’s no point in using those tools when you’ll get the highest deliverability ever using GMass. Plus, if you’re using GMass for your email campaigns, there’s a button in the GMass Settings box that sends the HTML to the link checker for you, so you don’t have to copy/paste your HTML. Then, you don’t have to copy/paste your HTML. It’s one-click magic for you. Just click the Link Checker button from the Settings box, and the link checker will automatically launch. Absolutely love your products! I have consistently achieved 60% open rates on my email campaigns. That said, there are maybe 2 or 3 campaigns in the last week or two have have shown stunningly low open rates for no apparent reason and it’s not due to blocks or deliverability issues from what I can tell. Any thoughts or advice on what might be going on?